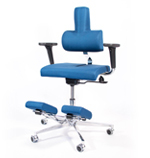 This amazing, ergonomic lumbar device prevents and reduces lumbar pain. 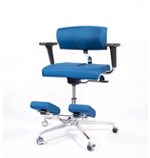 It also counters the negative effects of incorrect sitting postures and can be used with common chairs, office chairs and car seats, ensuring postural benefits whenever used. 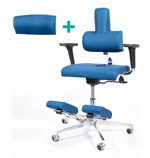 The two robust Velcro straps make it fully adjustable, providing adequate lumbar support and ensuring a correct back position while seated. Great! I do not have to look for anything else! Review by Giovanni S.
I use the cushion in the office and i think is very comfortable, much more than the usual office chairs, but it's the only cushion that I never tested. Not that beautiful, but very functional Review by Crescenzo S.
I used the cushion until last week and then I decide to buy the Ergonomic KomfortChair. The "obscene" cushion it's quite uncomfortable, but at the same time, efficient: it helped me to maintain a correct posture, accentuating the chest opening and the rotation of the deltoids (sorry for the little technical explanation) . The bad thing (apart from the aesthetic ... ) is that it often moves, even pulling all the strings. A love-hate relationship with the pillow Review by Matteo D.L. My relationship with the cushion is of love and hate: sometimes it doesn’t gives me any relief, indeed, sometimes it bothers me a lot. Nevertheless it helped me to maintain a more adequate posture. A little note to the seller: it would be helpful to add some instructions to indicate the correct zone where the cushion has to be positioned; the first few times I used to keep it too high and it caused me some bad feelings at the back. Overall it is a good product, not very cheap, but it does its duty and is certainly more affordable than an ergonomic chair! It works! Review by Luca T.
After some time I can say that it worked: I am using while sitting in front of the computer and now I can sit for hours without any problems. I wish was better Review by Stefania S.
I'm using at the office: it's ok, but I was expecting it to be better. Maybe it is not my kind of chair. I am very happy! Review by Davide R.
I'm so happy of my purchase that I cannot drive anymore without it! Great in the office and it the car! Review by Tiziana U.
I bought it to use at the office in anticipation of using it at home, because of the conversion of my contract of employment to teleworking. When I used it in the office, I had a “traditional” office chair. 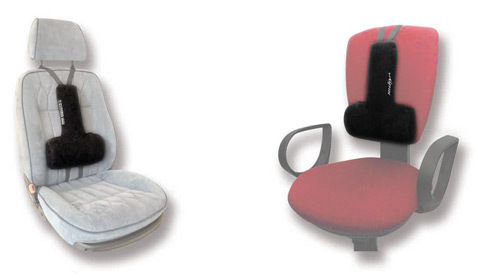 The pillow was a very comfortable support for the back, especially because thanks to its shape it opens the shoulders. But unfortunately my chair was not adjustable in depth, and as I am quite short, I was able to sit on the seat just until my mid-thigh, sitting down too far forward. In addition, even the tilt of my chair wasn’t adjustable, so I was always too straight and almost inclined back forwards. 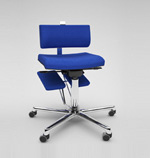 If you want to use it you have to choose a chair with proper a depth or adjustable, as the cushion depth is consistent. Then I moved to work from home, and while I was waiting to buy a decent chair, I used the pillow in the car. 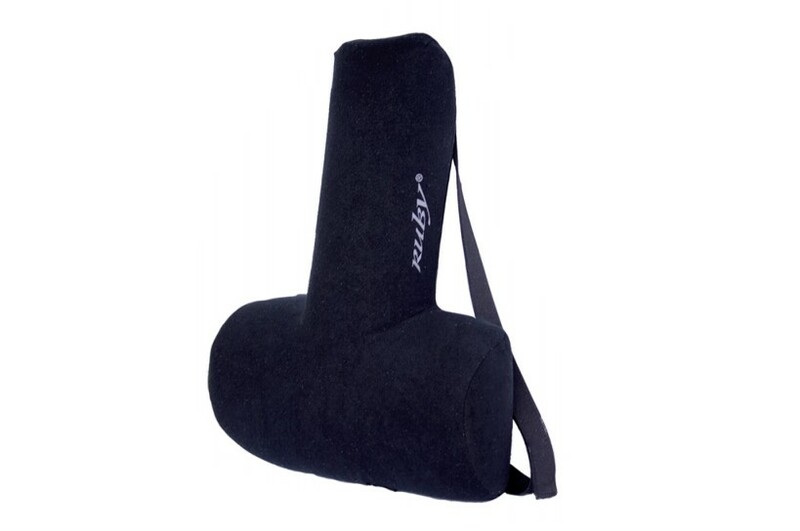 Now I can not drive without it anymore: this lumbar support has become indispensable. 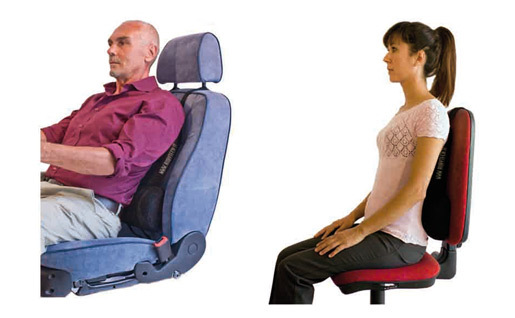 The only problem is when someone else takes the car and takes away the pillow or positions it differently, and in addition to adjusting the seat again in your convenient way, you must also re-adjust the cushion. Moreover, in the car all these long Velcro stripes can get in the way, especially those at the bottom, while for the top ones I make them go up and then "paste" them behind the back to secure the top cushion. To conclude, I make a consideration about the price. I brought the receipt to the health center to ask for a total or partial refund, but they told me that probably they will not be able to do it as they need a medical prescription... we'll see. It gets the job done Review by Paolo B. Good! It does its job. When you get use to it.. all good! 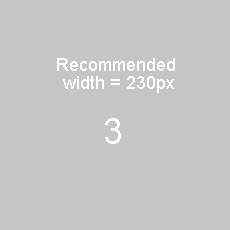 Review by Edgardo M.
In my opinion it is good. Initially having this “intruder” behind my back on my office chair bother me a lot. Now I've got used to it and when I change chair I realize that something is "missing"... Unfortunately my back problems are not solved but it wasn’t the task of this pillow. It certainly helped me to maintain a correct posture during my long working hours. All good! Review by Lucia C.